There are really no words that can describe the ecstasy of a GIANT COOKIE BAKED IN CAST IRON! What more can you possibly say? Cast iron skillet (or dutch oven), 10 to 12 inches in diameter. 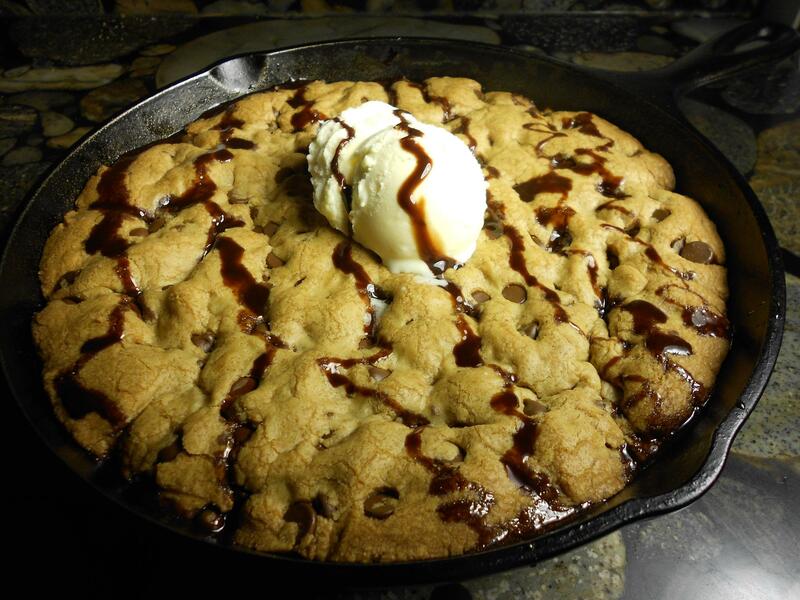 A larger pan will produce a thinner cookie, but the smaller pan will give a really, really thick cookie. Preheat your oven to 325 degrees Fahrenheit. 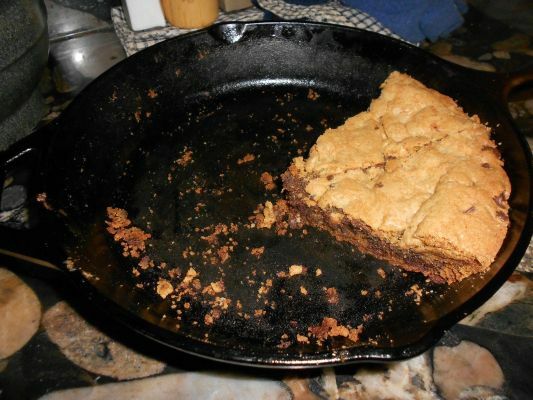 Grease the cooking surface of a cast iron skillet with shortening, including the sides. In the large bowl, whisk together the dry ingredients: flour, baking soda, and salt. In the medium bowl, mix together the wet ingredients: butter, sugar, and brown sugar. This can be done by hand if the butter is soft; you may need to soften the butter in the microwave oven for 15 seconds on high. After the sugar and butter are mixed (creamed) together, add egg and vanilla. Stir them all together until thoroughly blended. 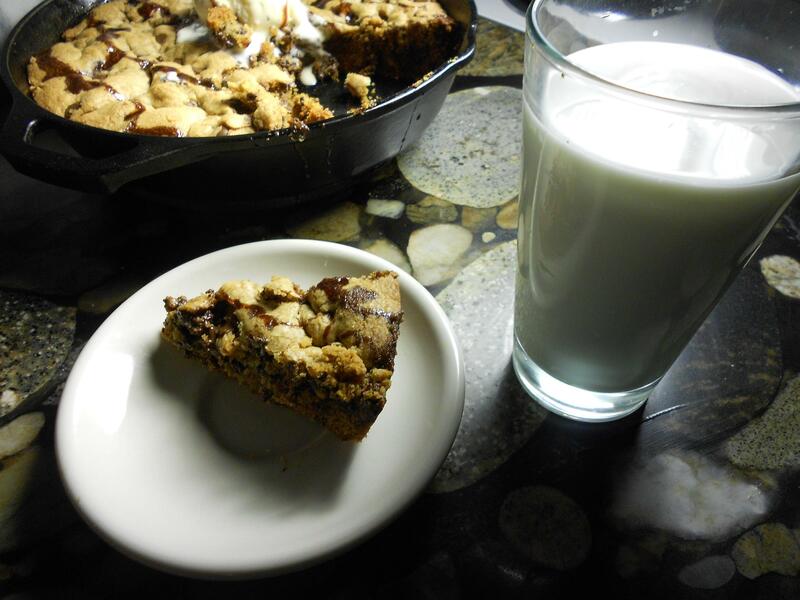 Pour in the chocolate chips and mix it all together. Empty your batter into the cast iron skillet. Using a large spoon or spatula (or by pressing it down with your hands), spread it all out over the pan. Let a young child nibble at some of the cookie dough. This is important. Place the pan in your oven and bake for 30 minutes at 325 degrees F (176 degrees C). After 30 minutes, remove the hot cast iron pan from the oven and let it rest for at least five to ten minutes, in order for the cookie to settle. Serve. Be careful not to burn yourself – the chocolate will still be hot and gooey. If you want a big, soft, yummy peanut butter cookie, add 8 ounces (1 cup) creamy peanut butter to the cookie dough mix, and mix it all together. You can also add 6 ounces of roasted peanuts to the dough, though this isn't absolutely necessary. Or, omit the chocolate chips completely and add 12 ounces (or more) of roasted peanuts. See also: Horrible Truffle Cookies. For truly dangerous and decadent chocolate chip cookies, give them a secret truffle center. Your cookies will be remembered forever. 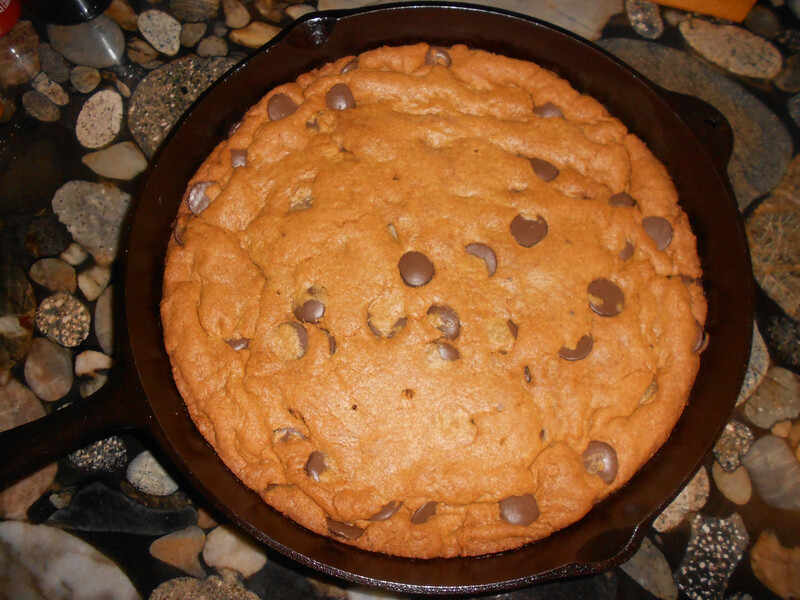 To truly make this cookie epic, bake a double batch of cookie dough in a cake pan. The result: Epic Bundt Cookie! 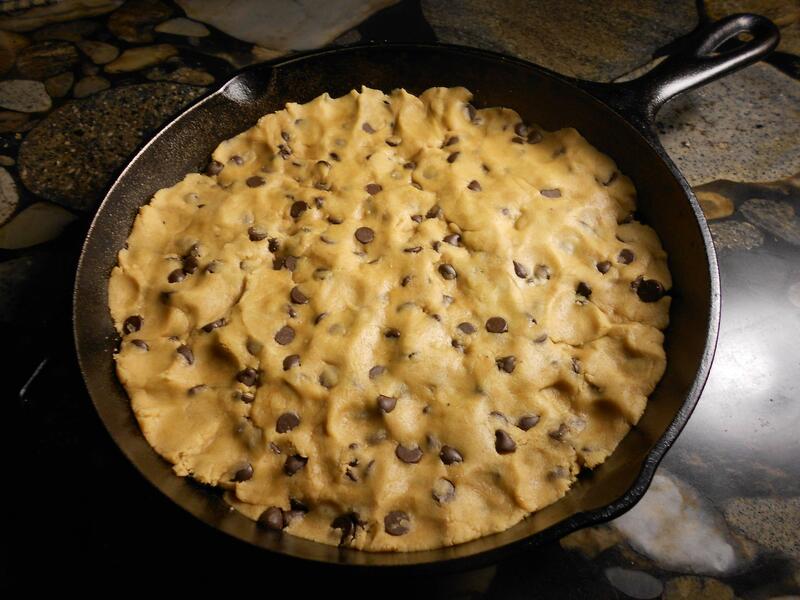 Finally, you can double the recipe and bake a cookie large enough to be served on a pizza pan. 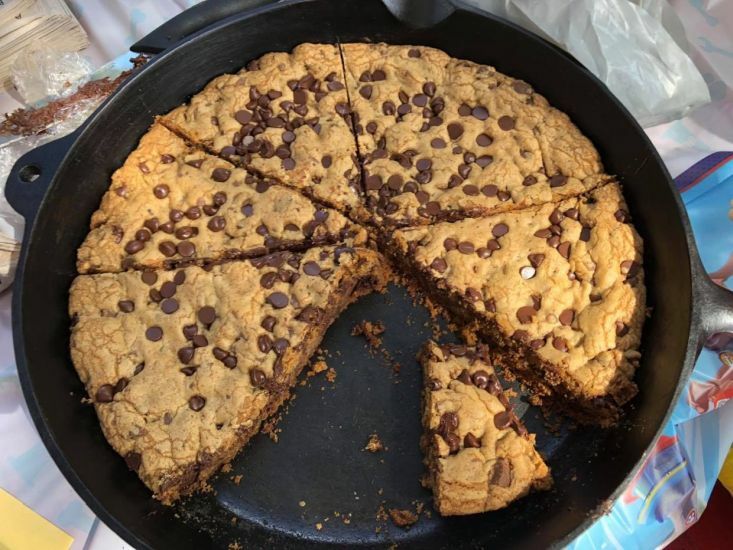 For an oversized pan like this, be sure to double the ingredients, lower the temperature to 325 degrees Fahrenheit, and bake for 60 minutes.